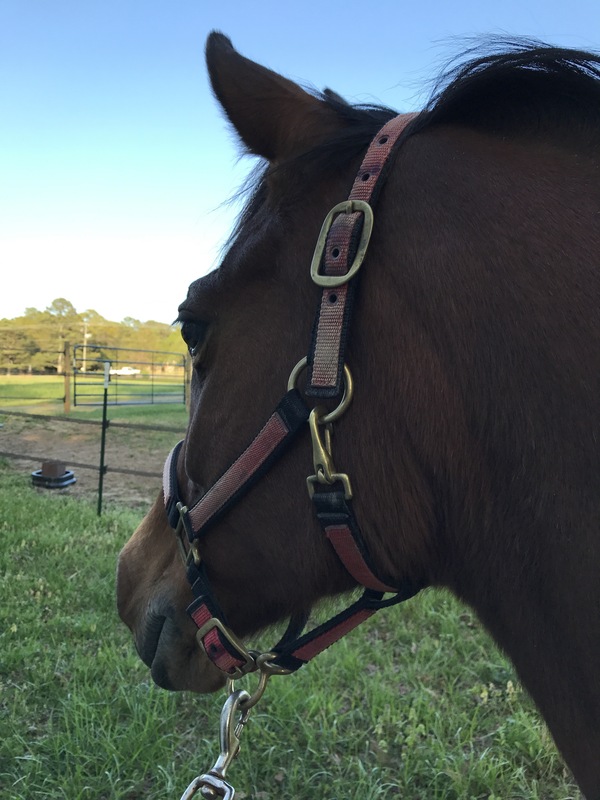 Eleven weeks and six lessons ago I started on a new riding journey with the goal to learn, improve my relationship with Gem and perhaps find a new competitive outlet. 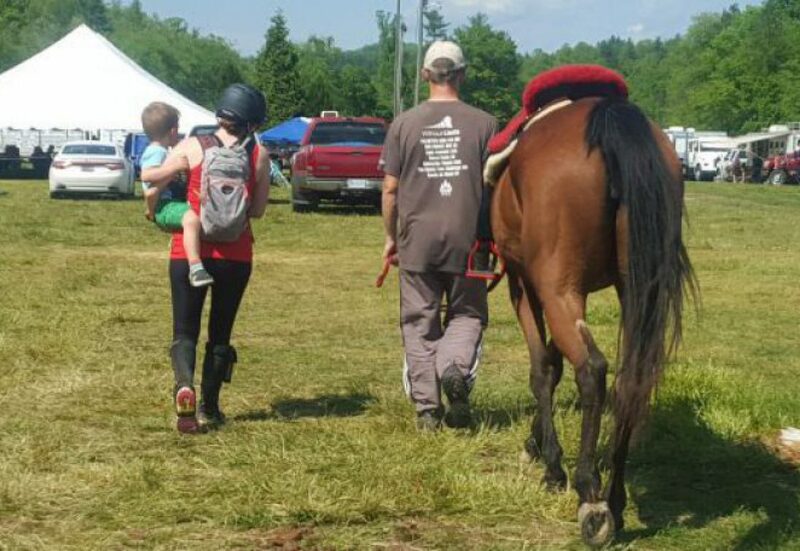 As I prepare to enter my first ever horse show, I think it’s a good time to ruminate on what has been accomplished thus far and where I’d like to go. In the beginning I would have bet quite a lot that I would have taken to dressage and been scared of jumping. Eleven weeks later and I find myself not enjoying dressage all that much and nearly chomping at the proverbial bit to jump. 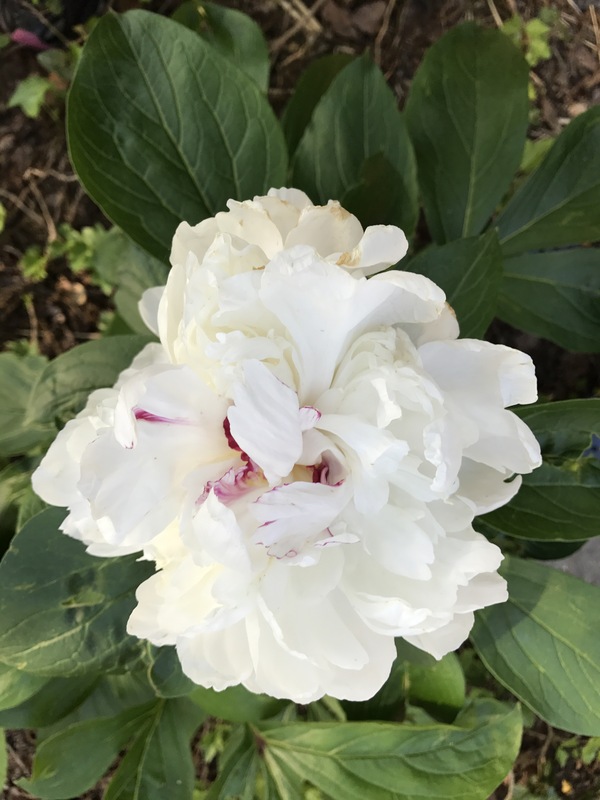 Our one peony opened up. Part of the equation is that dressage is very boring right now. 20 meter circles, halting, trotting a ton and some little canter bits thrown in. There isn’t a whole lot to be excited about, but it also has to do with my innate personality. I’m much more of a shoot from the hip, ask questions later, why not go for it, type of person. It’s difficult for me to get lost in all the minutia that is dressage. It’s just not what I geek out about, I suppose. Still, I understand the utility of getting at least the basics down and plan to continue with it and see where we go. If all was perfect, I’d love to reach first level with Gem as I think that knowing those skills and that level of connection, rhythm and balance is really important for basically everything else. I don’t see myself going to a pure dressage show, but you ever know. A year ago I never thought I’d be doing any of this. But in the larger picture of honing my skills and wants to better be prepared for when Gem is retired, I think I can cross a dressage specific horse off my list. Sometimes knowing what I don’t want helps more just as much as knowing what I do want. 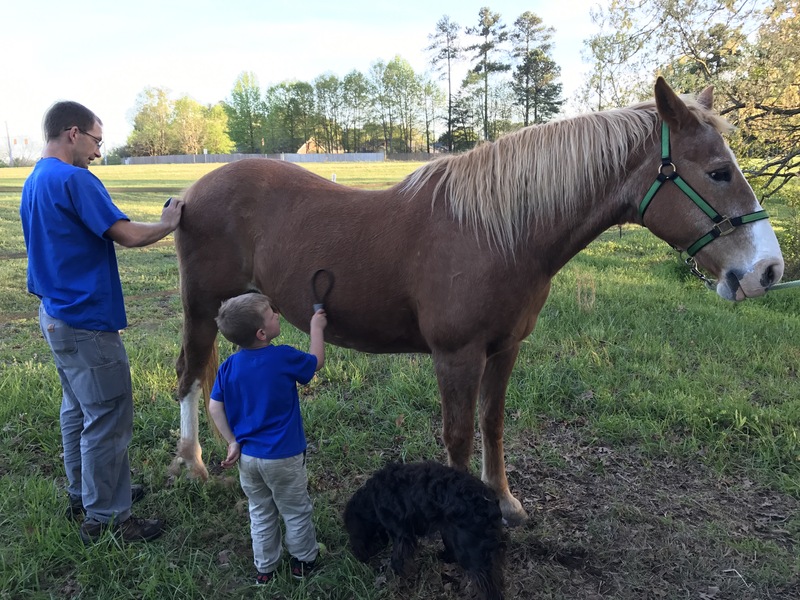 Wyatt helping brush Pete and looking like a mini Dusty. As for jumping, I love it. There is so much that goes into it that I never imagined. The balance required, the planning, the rhythm. To me it is just like doing dressage, but with the added bonus of jumps thrown in. I love it. Gem isn’t so keen on it, but that’s ok. At 18″ she can deal. I also like the speed of jumping a lot. While I’m only doing 18″-2′ cross rails right now, the fact that the exercises can be changed all the time keeps it interesting and not repetitive. This helps both Gem and me not get bored with doing the same thing for the dozenth time. While we basically are doing the same thing, it’s over a different jump, coming from a different direction or at a different gait which makes it seem new. As of right now, subject to completely change, I believe I would look for a horse with some basic jumping skills installed with both a knack for and a propensity towards enjoying the work. I have neither had the opportunity or the lady sack big enough to attempt cross country yet. Maybe this fall although Gem just plain hates bare wood and that’s basically what 99% of the jumps at my level include so it just sounds like no fun at all. Perhaps once we are both better at this whole riding thing we can attempt it and see. There are a ton of courses close by to school on so it wouldn’t take much to go. Ack. This post is already getting long winded and I haven’t even gotten to what I set out to write about: the changes already palpable in both of us. I guess I will save that for another day. For today, let’s wrap this up by saying that I 100% believe I made the correct decision in putting endurance on hold and exploring other disciplines with Gem. I adore my trainer and feel like she is the perfect fit for me right now. Gem and I are already so different than that first lesson it is incredible. I’m so excited for the new path we are on and I can’t wait to see where it goes. Aw yay this makes me so happy!!! I’m a huge believer that with the right support system and coach, and a sport that suits your taste, incredible things can happen for the horse and rider! Isabel and I transformed similarly upon starting to ride with my trainer P. So exciting!! Also ya never know – once Gem better understands this whole jumping thing she might surprise you with how into it she gets! I am hoping she sees the challenge in jumping and learns to really like it. Branching out is good and I think you have the right attitude! I started out riding Dressage what feels like eons ago. I too did not have the personality/patience (at the time) for the minutiae, all I wanted to do was jump! In time though the patience and desire for perfection built up, and yes I still don’t do straight Dressage and I don’t do eventing dressage but I do dressage for schooling. I think desire and stuff usually develops as you can see progress and how it all shapes the discipline and horse you love. Very true. The thing I really love about what I’m doing now is the endless possibilities for advancement. In endurance you could go up in distance to the 100 mile level which I did but that is about it. With these disciplines there is always more to learn. The investment you are making now is going to go far and who knows- maybe Gem will surprise you and learn to enjoy jumping XC. Can’t wait to read about your first competitive outing, have fun! It’s all about having fun. I don’t really enjoy dressage either, but it will help you and Gem be better at jumping as well. I just use it as a foundation. That’s my plan. It surprised me though. I had planned to really enjoy it much more. That’s so great that you are enjoying a new discipline this much! It definitely sounds like you have the “ideal” eventer personality and are a definite match for it. I also know what you mean about dressage- it can certainly be boring in the beginning, but I swear it gets better. Keep it up! Hoping to make it to the not boring parts. We have a long time to spend here first though.